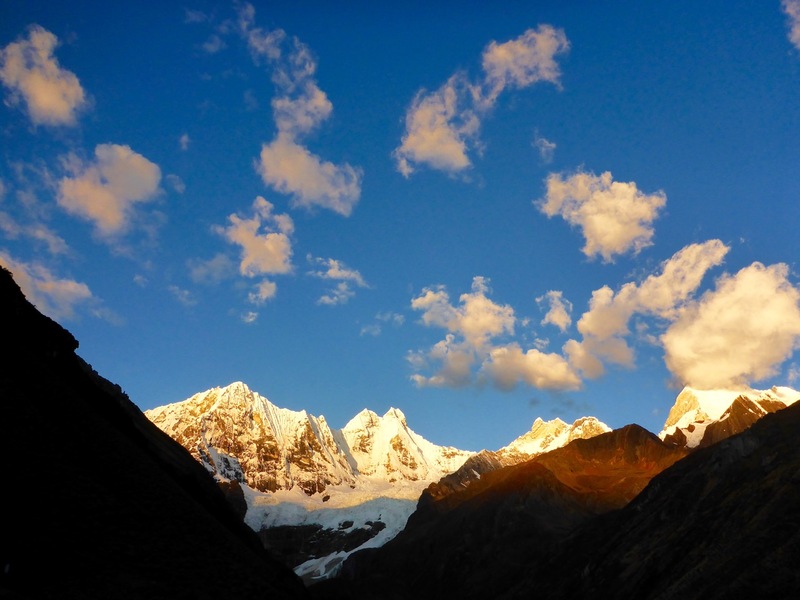 These are the technical details from our trek in July 2015 for anyone looking for info on Trekking Huayhuash Independently. If you’re looking for the color commentary and all of our pretty picture you can find those here. Bus: 5:30 am bus from the corner of 28 de Julio and Internacional. Notes: We switched buses in Chiquian about 7:30-8:00am and had enough time to grab breakfast there. We had some mild bus mechanical issues which put us about an hour behind. Then it was on to Llamac where we paid our first “fee” and switched to a cattle hauler truck (run by the bus company, no less) which we road on top of to Pocpa where we paid our second “fee.” We started hiking from Pocpa and with in 5 minutes we got a ride to the mining camp in the back of a pick-up truck which saved us another ~45-hour of walking. Overall we probably started walking a little after noon. And then another hour or so walking down the road to the Quarterhuain campsite. Notes: Not a lot of wind protection at Junca but not a bad campsite. Notes: Because it wasn’t even 11:00am yet when we got to Carhuaccocha we decided we would head towards Ciula Punta but the weather was rapidly depreciating (light rain/sleet/snow and then thunder and lightening). Our map showed the trail going along the East side of the first lake. We followed that and it appears that hasn’t been the trail in a while… a far amount of bushwhacking was involved while we could look across the lake and see a nice clear trail on the West side of the lake. Take the West trail and then cross back over after the first lake. We ended up camping in a nice depression with a big rock for wind protection next to the second lake (Lago Siula). 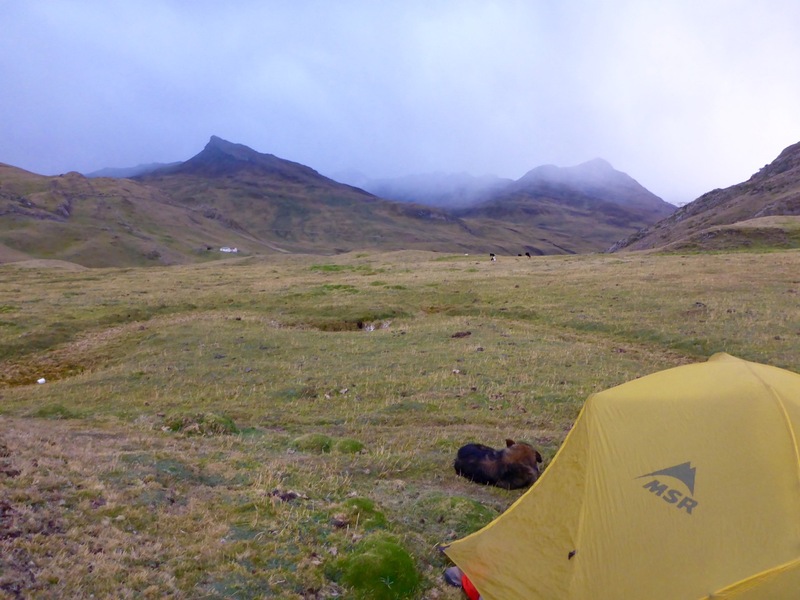 It was also just about the only place to camp between Carhuaccocha and the Pass. 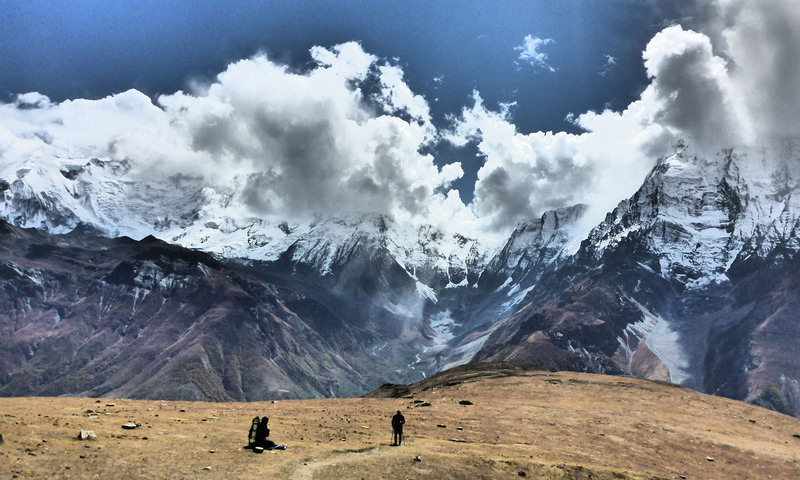 This turned out to be our favorite campsite of the trek. 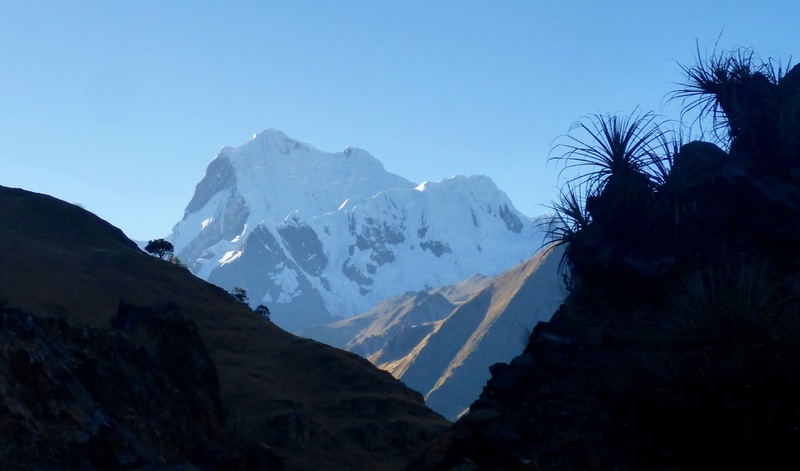 Notes: There were a few big groups at Huayhuash camp when we got there ~noon and the weather was not the best so we figured we’d push it to Agua Termales. 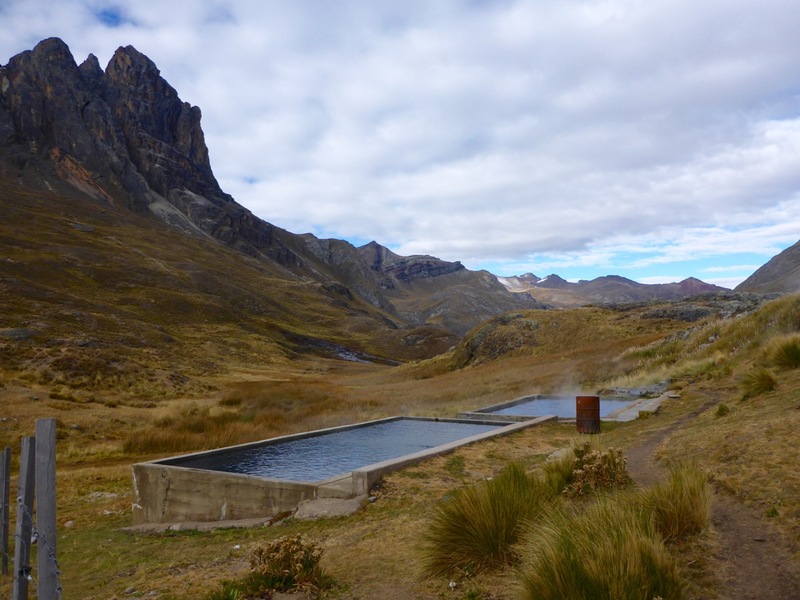 Agua Termales was another great camp and the Hot springs are perfect, should have stayed there for 2 days! Notes: This is where we really started having navigation issues. We lost an hour walking all the way back to the dame (which is what our map made it look like we should do) in reality you don’t have to back track very much at all, the trail is on the Agua Termales side of the rocks/hill that the trail and the river cuts between. Notes: Coming down the pass we ran into another couple that gave us some advice to “stay left when you get to the swamp… it’s a lot shorter than the right side that the donkeys go.” Hindsight, something was probably lost in translation and this added to our next error. We completely missed the campsite in the Nevados Valley and the trail to San Antonio Pass. Looking back it was probably where the trail split and the left trail went over a little rocky finger that sticks out into the valley and the right trail goes way out around it. Never the less, we never say it and by the time we realized we had completely missed it we were so far down the valley we figured we’d just keep going as the weather was crap and you couldn’t really see any of the awesome mountains we assumed were there. The trail crisscrosses the river as it goes down the valley and at one point it crosses the river at a little house and it looks like you’re walking up to someone’s house and not the trail. THIS IS THE TRAIL! We didn’t think it was and stayed on the north side of the river and the trail eventually disappears. A nice kid on a horse showed us a bridge and got us back on the trail and basically escorted us all the way to Huayllapa. (Thanks Harley!). I would not recommend going all the way to Huayllapa. Notes: There is a mining road (wide enough for a truck and tire tracks) that starts big switch back to the left steeply up the hill and there was a small cairn at the corner of the first one with a very small trail heading straight (towards the Tapush peak). We debated a bit and ended up taking the mining road, but at the top they meet up again, I would suggest taking the smaller trail as it looked like it would be prettier thought maybe a bit more challenging. Notes: Gashpampa was a pretty ugly campground, a couple of out houses (and old outhouse holes) lumpy, spikey grass and not much of a view (especially when it’s over cast). Notes: As we made our way around Mitishccocha we came to a little house, nice guy and we probably could have camped there much prettier and better camping that Gashpampa. But we wanted to make it to Jahuacocha Lake. Notes: Jauacocha was a pretty developed camp but the view is pretty epic. Notes: We followed the sign to Llamac (one of the only trail signs we saw on the entire circuit) and on about the 3rd falls pass a donkey driver passed us and asked us why we went the hard way and not the easy tourist way that doesn’t climb the mountain and just follows the river down to LLamac. 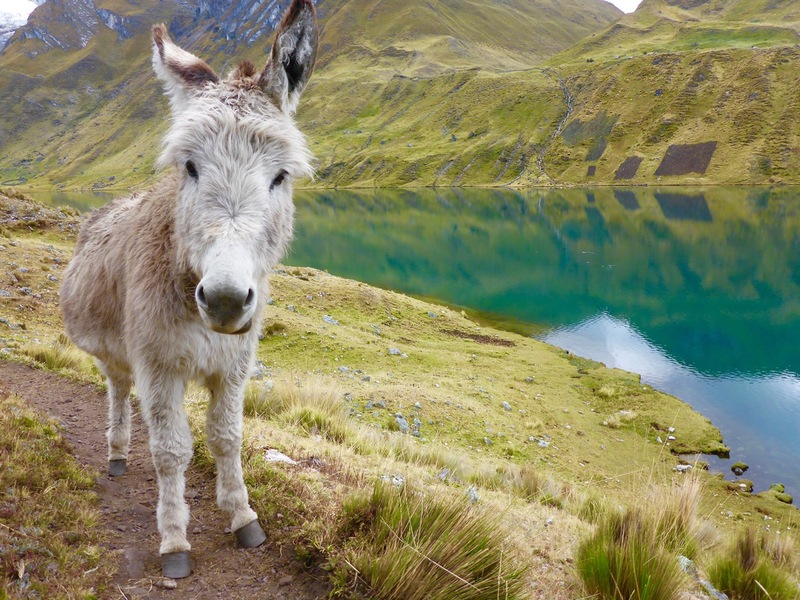 Apparently the high road, over the pass is the old way and only donkeys do it now. Notes: The bus back to Huaraz stops in LLamac on it was to Pocpa about 10:30am and then passes back through headed towards Huaraz at 11:00am. We also had another delay on the way back as a truck was broken down blocking the road so we waited about 2 hours for it to be fixed. All in we were back in Huaraz about 4:30pm. We used the Skyline 1:75,000 topo by Aonek’er. It was a source of constant frustration on the trail as it didn’t really have enough detail (we couldn’t see the peaks because it was overcast). It’s a bit outdated lot of trails (mining roads, donkey trails etc) aren’t really marked so there are a lot of forks that aren’t very obvious which way to go (as there is no fork on the map). They also put icons right on top of major intersections obstructing the trail. There is a better 1:50,000 “German made” map that got a green cover. Bring a compass for sure. There are LOTS of trails, People trails, Mining trails, Donkey Trails, Cow trails, game trails. And there are almost not trail markers or signs (apart form designating camp sites) and the one trail sign we saw pointed us the wrong way. You get the feeling they really want you to have a guide, because they aren’t marking anything. We spent a lot of time trying to decide which trail to take and often we made the wrong choice and ended up on the donkey trail. There weren’t a lot of people out on the trail we only ran into a couple a day (usually collecting fees) they were friendly and helpful if you asked. ALWAYS ASK to confirm you’re on the right route. Plenty of water all the way, we never carried more than a liter a piece at any given time. But it’s all needs to be cleaned. All in we paid about 195 Soles per person for our 6 days of trekking (about 2 billetes a day). 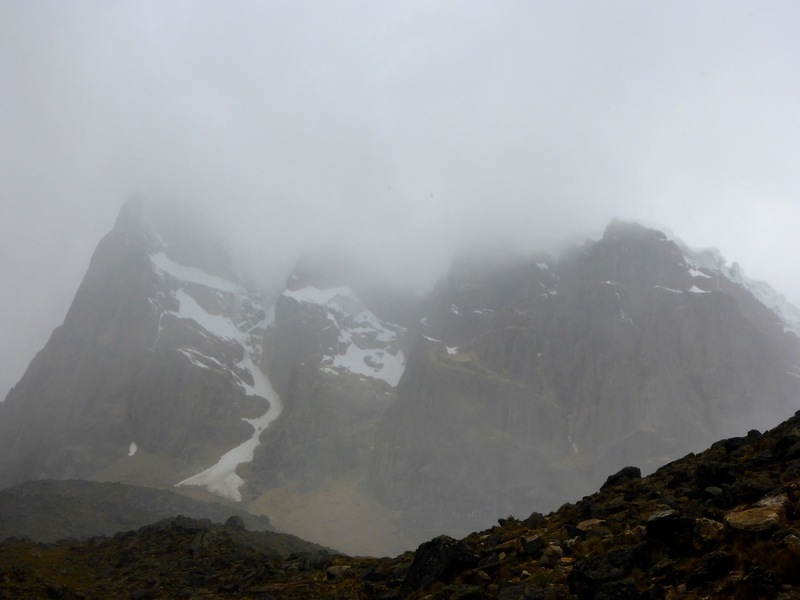 We were expecting “Andean Summer” with perfectly clear skys and perfect weather. We unfortunately got pretty misserable weather for the first 3 days. Rain/sleet/snow flurries and lots of clouds kinda killed all the views. Were back it was amazing! Looks like you had a good time… Your photos are wonderful! Yea it was amazing. Thanks for your info it helped.